Posted 12/6/2018 11:31am by Cherry Valley Organics. We've been making our certified organic, handmade soap for over a decade. Our soap-making process begins by selecting only the finest ingredients, some of which we grow ourselves right here on our Pennsylvania farm. All of the plant-based ingredients we can't grow on the farm are sustainably sourced, and none of our products are ever tested on animals. We make our natural handmade soaps in small batches, completely by hand. While our selection of handmade soap varieties changes with the seasons, here are our core varieties. 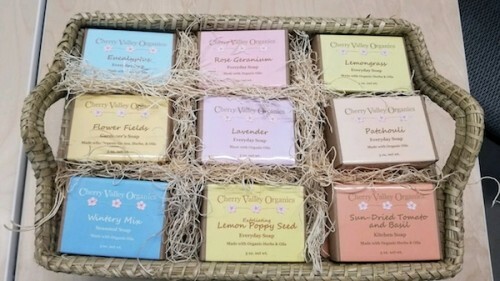 Click the name of each soap for more on that variety or to make a purchase. 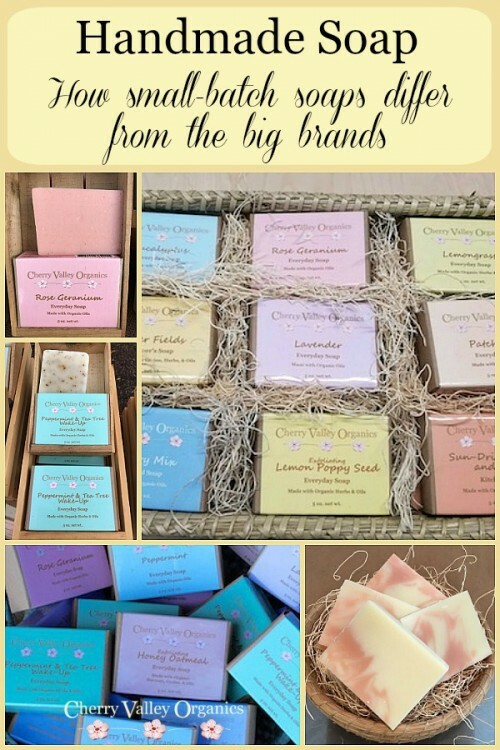 Join our Soap of the Month Club to receive an assortment of our natural handmade soaps. Choose 1, 3, or 6 bars per month, and shipping is included in the price. Click here to sign up. What makes our handmade soap different? 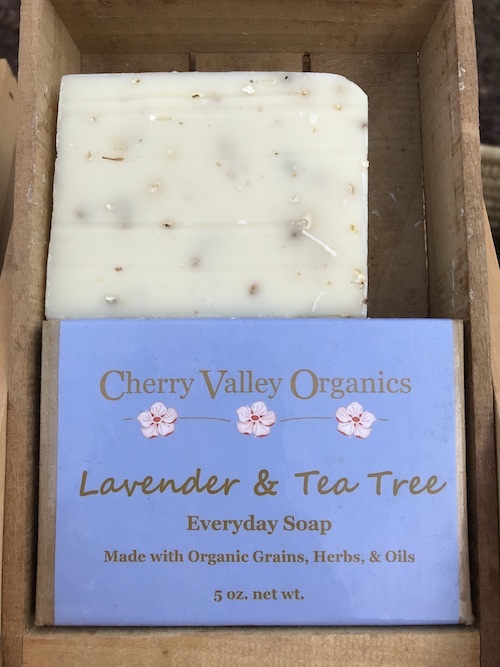 Our natural handmade soaps are not detergents, so they're softer on skin than most mass-produced soaps. We use essential oils to naturally scent our organic soaps, not artificial fragrances. And, we skip the artificial dyes, opting to use various combinations of herbs instead. Every ingredient is listed on the label, and many of our soaps are vegan. We do have a few that contain beeswax, so be sure to read the ingredient list for confirmation. As USDA certified organic farmers, it's important that our handmade soap contains responsibly sourced ingredients. You may have heard recent concerns about the effect of palm oil farming on wildlife. Rest assured that our soaps contain certified organic palm oil that's sustainably grown in a way that does not destroy wildlife habitat. In fact, other than the beeswax included in some of our recipes, we don't use any animal products at all. That means that, unlike most big, national brands, our handmade soap selections do not contain beef fat/tallow (sodium tallowate). The saponification process combines a fatty acid with a base (sodium hydroxide, a.k.a. lye, for bar soaps and potassium hydroxide for liquid soaps). Many big-brand soaps use beef tallow as the fatty acid, and it's most often sourced as a by-product of the factory farming industry. The fatty acids we use in our soaps, however, are only vegetable based. We use various combinations of olive oil, palm oil, and coconut oil in the saponification process. The USDA Organic Certification Standards do allow for the use of sodium hydroxide (lye) as the base in the saponification process as it's required for the chemical reaction to occur. Nothing else can saponify oil into soap, and since all of the sodium hydroxide is consumed and neutralized during the reaction, no lye remains in the finished soap. Glycerine soaps are also made by using lye in the initial steps of the saponification process. 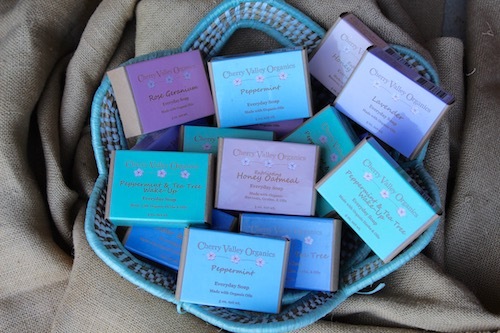 Our natural handmade soap is available for purchase from our online store. 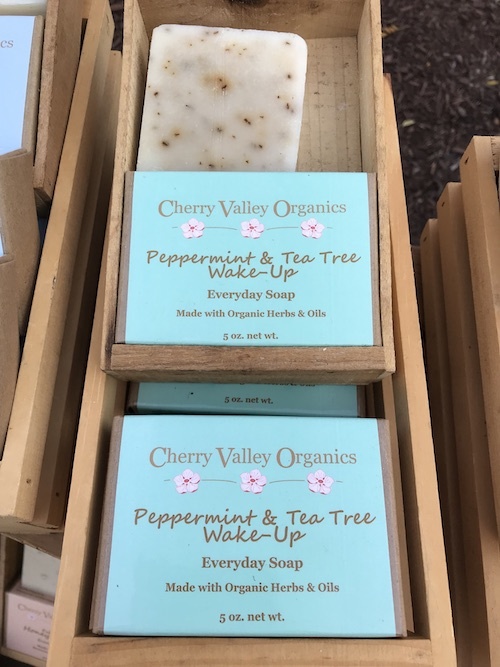 We ship our soaps to customers across the U.S.
Our soaps are also available at our in-season farm market booth on Saturday mornings in Sewickley, PA. In addition, you'll find a full selection of our handmade soap at our store at 1713 Main St in Burgettstown, PA.